Situated on St Thomas island is Charlotte Amalie, which is the capital and largest city of the warm Caribbean’ Virgin Islands. This vibrant city is renowned for its wealth of duty-free shops, wide range of activities, rich heritage and stunning bays – including the world famous Magens Bay beach. Plenty of lodging properties can be found within close distance of both cruise ship passenger terminals – Havensight (West Indies Dock) and Crown Bay pier. With its beautiful warm weather, a visit to the Virgin Islands in the Eastern Caribbean presents a fine choice for you throughout the year. Everyone enjoys saving money, and if you are flexible with your accommodation preferences, it’s possible to discover some amazing deals and grab yourself a bargain on a cheap hotel or resort. Another great way to save money is to travel during off-peak season – you will still benefit from glorious warm weather while also enjoying extra spending money and cheap accommodation. Take a look at the detailed listings for each hotel you’re interested in as peak season dates may vary from one holiday rental to another. Some hotels also offer promotional deals from time to time, so keep an eye out for those. 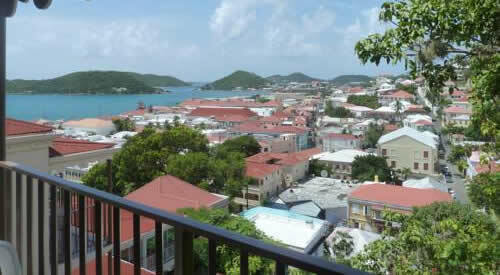 Budget friendly Bed and Breakfast property located in historic Charlotte Amalie, close to downtown shops. One mile from downtown shops and dining. 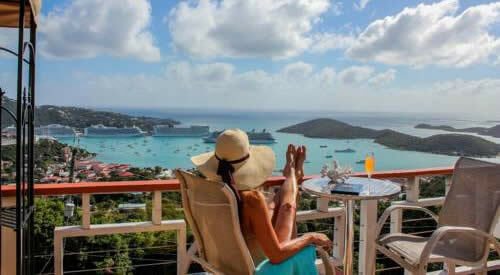 Property offering splendid views of Charlotte Amalie harbor and cruise port. Beach resort in St. Thomas, Virgin Islands right on the Caribbean Sea. Large cruise liners can dock at two different locations. Located on the West Side of town is Crown Bay Center, located at Crown Point Marina. Most commonly ships dock at the West Indian Company Dock (referred to as Havensight), which is the larger dock located East of the town centre. 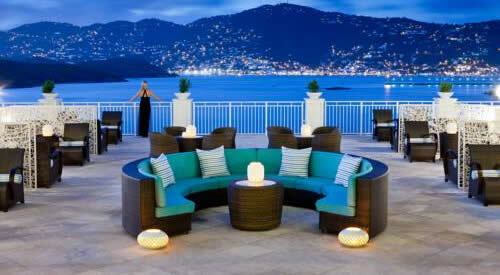 Both terminals however are located close to downtown Charlotte Amalie (5-10 minute taxi ride). When it’s very busy in town, some large ships remain at anchorage in the Charlotte Amalie harbor. All major cruise lines are docking in St Thomas, and it’s one of the busiest ports in the Caribbean. Many cruises depart from Miami fl. (Miami Beach) or Ft Lauderdale in Florida (see all hotels). St Thomas’s most famous beach ‘Magens Bay‘ can easily be reached by taxi. A luxury cruiseliner offering itineraries from the port is SeaDream Yacht Club. As the island is just 32 square miles, all holiday accommodation is within reasonable reach of the ship terminal. There are taxis, public transport and hire cars that make it easy to get about the island and explore. Beach side rentals on the island, such as at Lindbergh Bay, may be a fine choice if you expect to spend a great deal of your time at the beach. If you’re a couple planning a romantic vacation, you may prefer to stay at a delightful bed and breakfast overlooking the city, or perhaps you would rather a secluded private villa. The city offers a choice of hotel inns that are within walking distance of lively bars, high-end boutiques, bustling markets and great restaurants. For a home from home experience with privacy, luxury villas in the less busy North-side area of the island offer exactly that. Whether you’re visiting the island as a family, couple or with a group of friends, all-inclusive resort hotels are ideal. Look out for the variety of facilities offered, which may include swimming pools, on-site restaurants, shuttle services and activities, such as golf. With a terrific choice of accommodation available, it’s easy to select and book the right lodging facility for the perfect vacation. Once a haven for pirates, the island is nowadays a popular holiday destination that attracts over one million cruise passengers every year. Visitors are well provided for with a great choice of accommodation in the city and beyond, to suit various budgets and preferences. A few minutes ride from the terminal port is the downtown area, where you can enjoy shopping in luxury boutiques, dine at one of the many restaurants and explore buildings of historic interest, such as the early 17th century Frederick Lutheran Church and Bluebeard’s Castle. Stunning views over the island can be seen from Paradise Point, which is easily reached by aerial tram. The island is also home to the popular Coral World Ocean Park where you will have the opportunity to view marine life through underwater observatories, enjoy snorkeling, and take part in an up-close sea turtle encounter. If you fancy sampling the local food, be sure to visit the island during one of its Food Carnivals, and try the delicious morsels and drinks being served at the booths. The US dollar is the local currency. English is spoken on the island. Some French Creole and Spanish is spoken as well. Cyril E. King Airport (STT) is the primary airport, located a few miles west of downtown Charlotte Amalie.